I’m a bit of a collector when it comes to travel. I not only collect tacky key rings from every destination, I also find quirky pieces that make me think of my adventures every time I see them. I purchased this purse back in 2014 when in Zurich, Switzerland for an overnight stay. When strolling around the city’s busy streets during a very wet downpour, I walked into a store and spotted the purse. Being a little bit tight on money, I couldn’t justify spending so much on a wallet that I didn’t necessarily need. But, I couldn’t stop thinking about how much I loved it, so I gave in – went back to the store and purchased it. I think I love it so much because it’s so unique, and really shows my love for animals. I get so many compliments on it every time it’s spotted too! I think I’ve already told this story on my blog, but for the purpose of this post, I’m going to tell it again! Around 48 hours later, in a completely different city of Agra (an 8-hour drive) we received a call in our hotel room at 5 AM, to let us know that the man had actually delivered the jewellery to us! The long-distance journey was not a negative one for the man, as it gave him the opportunity to see the Taj Mahal for the first time in his life – Such a beautiful story and such a kind-hearted, beautiful man! If you’re looking for some travel souvenir ideas, jewellery is a very amazing option. Especially if you want something that will last a lifetime! 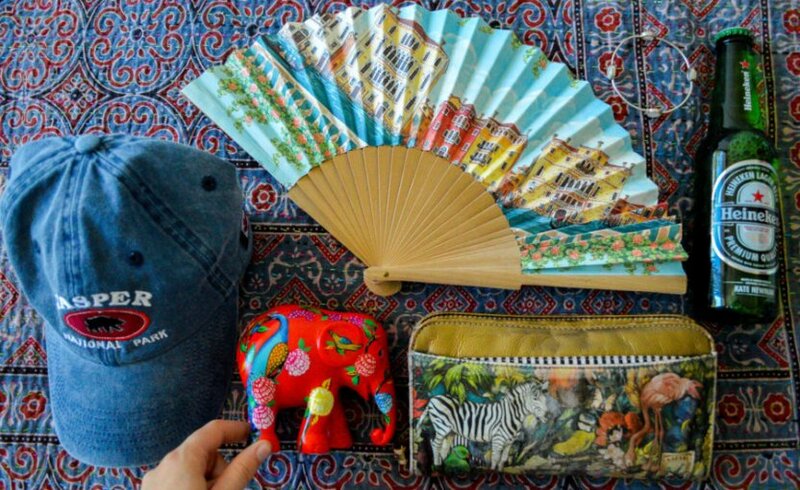 This beautifully handcrafted fan came from Venice, Italy. Fans are such a big touristy piece throughout the country, but this one cost far more than just a few dollars that you frequently see in the streets. It’s very sturdily made and makes the perfect art piece in my home. The hand-painted detail perfectly represents one of my favourite Italian destinations! I’m not the biggest hat wearer at the best of times, but this cap certainly changed that! I spotted this cap whilst in Jasper, Alberta and basically fell in love; the vintage feel, un-centred logo and all. My favourite part of the cap is the small badge I added to the outside to keep the strap in place. It says “Friends in High Places” and is very sentimental to me as it displays all the animals I was lucky to spot during my time in the rocky mountains! This beautiful handmade bag was purchased in a small store on the Malolo Lailai Islands and is entirely created from recycled plastic and wrapping. The barcodes and nutrient label are proof of that, that’s for sure! I’m all for caring for the environment, and recycling for my materialistic needs is the perfect way to do so. When I was on one of my family trips to New Zealand, I was staying in the guest bedroom of my aunties beautiful beach view home and commented on a pillow that I really loved. She very kindly gave me the beautiful pillow, which now sits in a gold wire basket at the end of my bed, and makes me think of my second home in NZ every day! Possibly the most touristy souvenir of them all, but I love it! On a rainy day in Amsterdam back in 2014, my partner and I visited the iconic Heineken factory (he’s a beer lover). I don’t drink beer on the best of days, and the Heineken factory was no exception. My numerous free beers were handed on to my partner who undoubtedly got very drunk… I ended up having to walk him home in the crook of my arm whilst dodging cyclists and holding an inside-out umbrella in the other hand. It was a hilarious experience, and this Heineken bottle with my name printed on the front reminds me of the day at every glance. This little monster could be one of the following – super cute, or super creepy. I’m still not entirely sure. This little guy was purchased at the Keflavik airport in a very unique store. The creepy little figure is handmade from a woman named Alma, who’s inspiration stemmed from the sagas the people of Iceland would tell their children in the olden days when they still lived in turf houses and believed in strange creatures. They would tell their stories under the dim light of oil candles, and the flickering light and disturbing shadows would only add to their stories! The wool monster makes me think about the unique country of Iceland, and the strange beliefs that used to lie within the country. This beautiful quilt was also purchased in Jaipur, at a warehouse where hundreds of unique prints were hand made and sewn. Unfortunately, the quilt was spotted at the start of the India trip, so it had to be lugged around in our suitcases for the remainder of the journey. It now lives on the end of my bed, where it has been ever since my return! A percentage of every purchase of the small statues is donated to elephant welfare and conservation projects through the Elephant Parade. Not only is it a super cute souvenir, but these elephants are also helping save the lives of thousands of real African and Asian elephants who die due to ivory poaching and human conflict every 15 seconds. Sticking on the theme of wildlife, 2016’s trip to Borneo was simply to experience exactly that! The big softy that I am, meant that adopting animals that had been through hardship was without a second question. In the Sun Bear Conservation Centre in Sepilok, I adopted a little female Sun Bear called Rungus! She is said to be the most peaceful and kind-hearted bear in the centre and was rescued from being locked in a tiny cage as a pet after her mother was brutally killed due to deforestation. The adoption certificate and soft toy are the perfect representation of her! Do you have any particular travel souvenir ideas? What do you have in your personal souvenir collection?